Most people seek spirituality within the framework of a belief system or religion. This is the traditional approach. I have a good friend who said to me that she wasn't religious, but she wanted to believe in something. She wanted an authentic experience of spirituality without having to believe in a supreme being. There are millions of people like her. On forms that ask for "Religious Preference," they enter "none." At this point in human history, there's no tried-and-true system my friend can turn to to get what she wants. I recommended that she read Eckhart Tolle's book, The Power of Now: A Guide to Spiritual Enlightenment. His approach to spirituality is to silence the chatter of the mind to achieve a hear-and-now awareness of the present moment. Life is sacred, being alive is sacred, and he considers this pure, unfiltered experience of the self to be a central aspect of spirituality. Also, Tolle chooses to see the universe as a kind of cosmic intelligence. He envisions a grand consciousness, something purposeful that is larger than ourselves. I don't relate to this concept, but I do like the way he coaches us to achieve an awareness of being alive. Being conscious of our existence, appreciating that we are alive, experiencing what we are - surely this is an important aspect of spirituality. Beyond the self there are billions of other human beings, each one alive and sacred, though usually not aware of his or her spiritual nature. Being "in the moment" with another human being, appreciating another person's reality and sacredness, the special aliveness of another individual - this, it seems to me, expands our spirituality to another level - that of relationships. And of course there are all the "non-human" beings we can relate to, which we often refer to as "creatures." Like Ernest and Baby Girl, the affectionate, intelligent cats that are a part of our family. We can achieve spiritual relationships with the rest of nature, by experiencing it for what it is without the chatter of human nonsense. And beyond our relationships and communities, there is the larger natural world, including the universe beyond our planet-home, Earth. Can we achieve a spiritual relationship with the universe? I believe so, but I think this is more challenging, because even though the universe beyond Earth is quite real, when we look up on a dark night, all we see are tiny points of light. Scientists say some of these points of light aren't stars, but massive clusters of stars. This is new knowledge. They found proof of other galaxies beyond our own Milky Way galaxy less than a century ago. Scientists tell us this, and we can see the photos of various galaxies taken by powerful telescopes. These are awesome and beautiful images, though it takes some effort to achieve the stirrings of spirituality staring at second-hand, two-dimensional pictures. Let me tell you about a personal experience. I live in Texas, and my wife and some friends decided to visit the McDonald Observatory in the mountains of west Texas. It was a moonless night, and as we sat on benches outside, a guide gave us an orientation of the night sky. Afterward, several different telescopes were set up for visitor viewing. In one of the telescopes I saw a clear view of Saturn's rings. It was like being there, though Saturn is about 750 million miles from Earth - eight times the distance from the Earth to the sun. This was not a photo but a direct view of the planet as it existed in that moment. I let that sink in, and I felt a sense of awe at this reality and my relation to it. As I peered through another, stronger telescope I saw something that swept me away. It was not a planet. It was not a star. It was the Andromeda galaxy. I saw its swirling shape and that it consisted of an untold number of stars. Not a photo. Not an animation. But the galaxy itself, far from Earth. 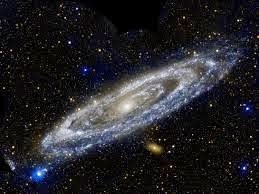 I learned that the Andromeda galaxy is 2.5 million light years from Earth, which is a distance impossible for any human being to imagine, and that it contains a trillion stars, more than twice as many as our own Milky Way galaxy. Our guide also said that it was moving through space towards our galaxy and would merge with it three or four billion years from now. For me, this surge of awareness and knowledge and awe was unmistakably spiritual. This vision of Andromeda, seen through a looking glass, helped define me and my place in the universe. I've written this post partly for my friend, to affirm that you can, if you seek it, find authentic spirituality not only in yourself, but in relation to others and to the universe. It has to be a personal quest, not an easy journey, because this kind of spirituality isn't a packaged belief system as most religions are. But it's achievable.